It’s officially soup weather here in the Northeast. Now that the days are shorter and less likely to get above 50 degrees, hot soup is a favorite staple in our diets again. As the warmth of the summer sun becomes a distant past, soup as well as hot beverages are like comforting familiar friends that make the increasingly cold weather bareable. That and all of the delicious holiday food, of course. My grandmother had many tasty soup recipes both published (in “The Art of Good Cooking”) and unpublished. I have yet to try them all but I’ve been very happy with the ones that I’ve posted here such as Stuffed Cabbage Soup, Basil Vegetable Soup, Fresh Tomato Soup, and New England Clam Chowder. Soup recipes are also some of the easiest recipes to change and adapt to your preference. This Mizutaki recipe is a good example. It can be made with chicken, beef, or fish and other vegetables, such as enoki mushrooms, can be added as well. Similar to hot pot, the sauce is really the most important part. 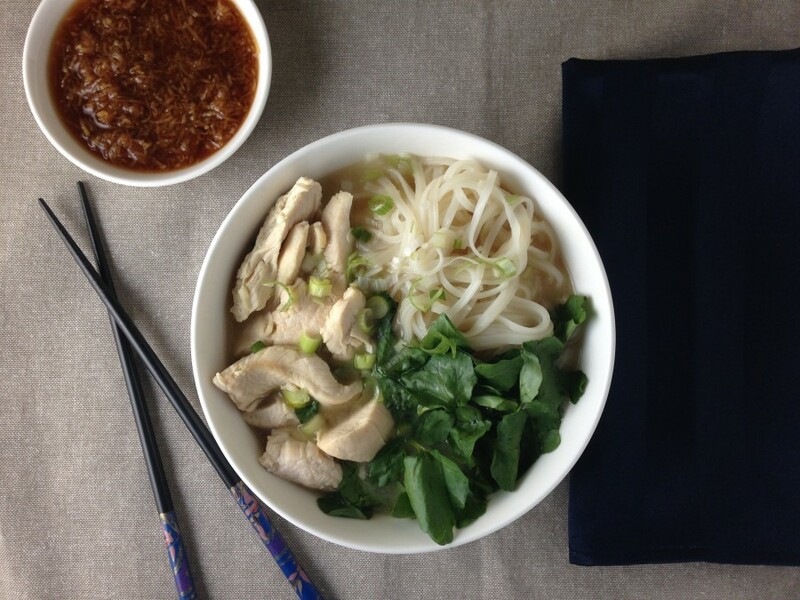 The chicken is cooked in the broth until just barely tender and then placed in soup bowls with spicy watercress and cooked vermicelli rice noodles. The broth is poured into the bowls and the meat and vegetables are dipped in the sauce before eaten. An intense combination of soy sauce, lemon, daikon, and ginger, the sauce balances the subtle light flavor of the broth. Much like many of my grandmother’s ethnic recipes, it took some time to figure out the origin of this dish. The title is spelled Misu Taki in her book but after researching, it seems to be an adaptation of the lesser known Japanese Mizutaki dish. Written and tested in the 1960’s, this recipe must have been incredibly unique, especially with the use of daikon or chinese radish (a store that no longer exists, “Japanese Foodland Inc” on Broadway in NYC is listed as a source in her book and is noted as having “very good Japanese soy sauce”). But I can imagine my grandfather, a lover of all types of Asian food, enjoying this soup on wintery days in Harlem back when Chinese take-out was a novelty. My grandmother writes in the introduction of this recipe, “This is not the original version of misu taki – but it is my own, and very good I think.” It is still an easy recipe to make your own and still perfect for a cold winter-like day. Combine grated daikon, ginger, soy sauce, and lemon juice. Divide this mixture among small bowls. Heat chicken stock in a heavy pot over medium heat until simmering. Taste for seasoning and correct, if necessary. Add chicken pieces all at once and cook only a few minutes, until chicken changes color. Be careful not to overcook. Turn heat off. With a slotted spoon, remove peices of chicken to serving bowls. Place cooked noodles and watercress in each of the bowls. Reheat broth and boil for a few minutes, then remove from heat. 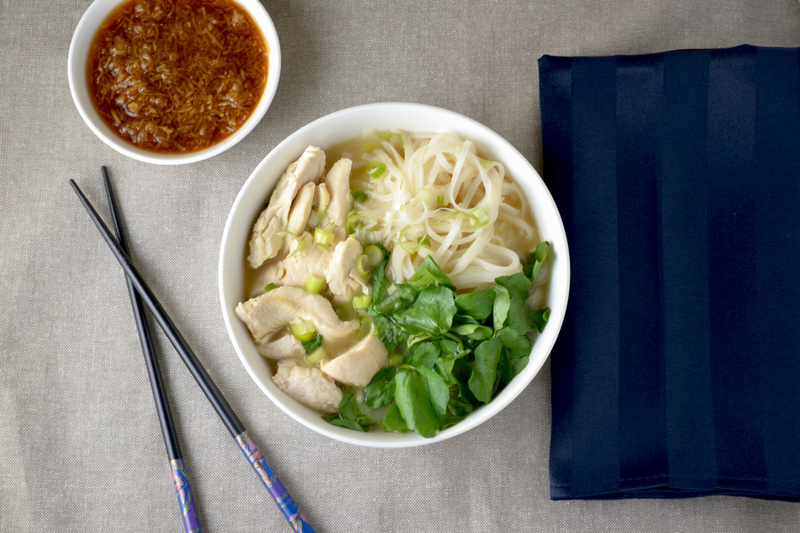 Poor broth over chicken, noodles, and watercress. Sprinkle with scallion. Serve with small bowls of soy sauce mixture for dipping chicken.